Samurai Spirits Zankurou Musouken (サムライスピリッツ 斬紅郎無双剣) is a 2D fighting game developed by SNK as part of the Samurai Spirits (Samurai Shodown in the west) series. It was released, among other consoles, for the Sega Saturn. 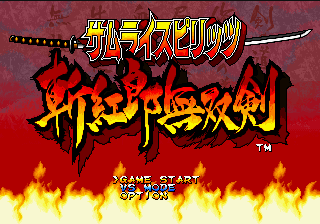 Zankurou Musouken is the third main entry in the series. Had it been released in the western world, it would have likely used the name Samurai Shodown III: Blades of Blood like other ports. Main article: Samurai Spirits Zankurou Musouken/Magazine articles. EN: Fair and Square "II"